We are excited to share with you some news about the progress on the plans that our capital campaign will make possible. As previously announced, we will construct a 3-D studies facility on our property adjacent to the parking lot on the rear of our Carter-Kelsey building. We have received approval from both the zoning and planning boards of the City of Lebanon to move forward on the construction. The existing building, a small one-family home from 1890, will be demolished in order to provide the necessary space for the new construction, scheduled to begin in April 2016. The re-useable parts of the house have been salvaged, including flooring, windows, doors and cabinets. 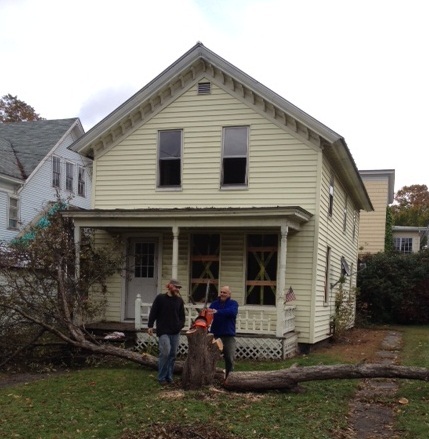 While the lovely crabapple tree on the east side of the house could not be saved—it was just taken down by AVA artist and board member Michael Kraatz, ably assisted by Justin O’Rourke (see photo)—the wood from the tree is being stored for use in the 3-D center’s new woodworking studio. Before demolition of the remainder of the house takes place later this month, the Lebanon Fire Department will undertake a training session at the site. They will not burn the building down, but will practice access and rescue operations from the roof. We continue to make progress on our $3.5 million capital campaign. A $200,000 grant this month from the Timken Foundation of Canton helped push us beyond the half-way point toward our goal. We also recently met the challenge from the Byrne Foundation by successfully raising $25,000 in new or increased campaign gifts, and those have been matched dollar-for-dollar by Byrne. In addition, our efforts to eliminate the mortgage on the Carter-Kelsey Building have been extremely successful—in just this past year, the mortgage has been reduced from $410,000 to $130,000. With the pledges we have received, the mortgage will be completely eradicated by October 2016. In addition, we continue to develop our plans for the new artist members’ gallery. We are looking forward to providing a beautiful space for our artists to share their work with both the community and other artists, including a frequently rotating show space, promotional opportunities through digital archives, and gallery store possibilities. Please stay tuned for more progress reports!